CEDAR FALLS- Faye M. Bossert, 97, of Cedar Falls, died Sunday, June 14, 2015, at Windsor Nursing and Rehab Center. 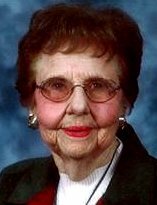 She was born August 22, 1917 in Iowa Falls, daughter of John Weller and Jennie (Luiken) Grieves. She married James F. Bossert on February 8, 1942 in Missouri. He died November 6, 1987. She graduated from the School of Cosmetology in Des Moines and owned and operated Cut and Curl beauty shop. She is survived by a daughter, Bette (James) Lynch of Corcoran, Minnesota; son-in-law, Chuck Ridder of Cedar Falls; five grandchildren: Tami (Mike) Jensen, Tom (Sherri) Ridder, Cindi (Bill) Patten, Chris and Joe Lynch; and seven great grandchildren: Justin Jensen, Jalen, Jared and Jackson Ridder, Ashleigh Jensen, Cali and Camryn Patten. Faye was preceded in death by a daughter, Janyth Ridder; granddaughter, Michelle Ridder; and a brother, Donald Grieves. Services: Wednesday at First Christian Church, Cedar Falls, with burial in Steamboat Rock Cemetery. Visitation from 5 to 7 p.m. Tuesday at Richardson Funeral Service and also for one hour prior to services at the church.